Today's mission is to organize your paid bill stubs or statements. There are some times when you might, for a while, hold onto these statements, so here's how to organize bills quickly and efficiently for the slim chance you'll need them later, before you shred the statements. First, if you haven't already, you should declutter older bills stubs and statements, shredding most of them since they have personally identifiable information on them, typically. 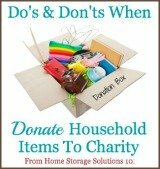 The reason, of course, is that there is no reason to organize paper clutter, but instead you need to get rid of it! How Long Should You Keep Paid Bill Statements? 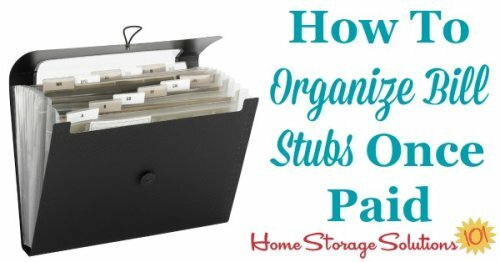 I've discussed in more detail how long you should keep your paid bill statements and stubs in my article all about how long to keep various types of papers here when you are decluttering papers. However, the general rule is that you should keep them for approximately a year, perhaps less. At the least you need to keep bill statement until you get the next bill in the billing cycle, so you can confirm that the company properly credited your account for your previous payment. In addition though, I have personally found from the small number of bill disputes I've had over the years, that it is much simpler to deal with these disputes when you have the proper documentation and records in place. Some of these disputes arose quickly after the bill first arrived, or was paid, but to be on the safe side keeping paid bills for approximately a year or so after payment can be helpful and with my system that I'm sharing below for organizing them it is easy to do. Further, if you actually do have a dispute about a bill it is best to keep such disputed records, even once you think everything has been resolved, for at least two to three years (or longer, depending on your state's statute of limitations for contract disputes or open accounts). This week, in the Organized Home Challenge, we're focused on the whole process of organizing bills, which is why we're focused on this mission today. However, in a couple of weeks we'll talk in depth about setting up a filing system, but right now I'll briefly discuss how to save these paid bills records. The easiest system, in my opinion, is to save all your paid bills by the month in which you pay them. 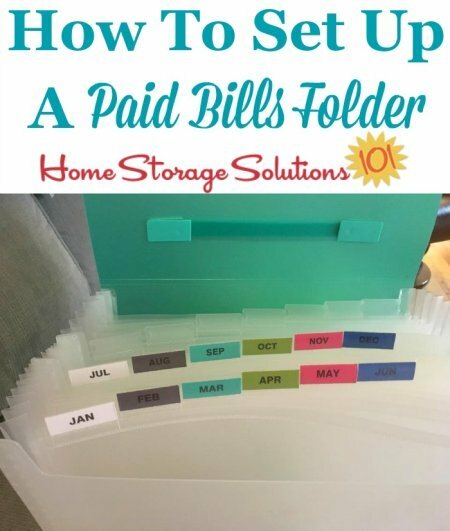 That means, at the beginning of the year, you should create 12 folders, labeled January through December, and as you pay each bill just drop the paid bill into the correct month's folder. 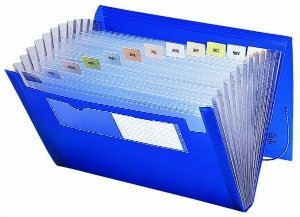 In the alternative, get an expandable folder with twelve compartments (such as the one to the left, and have one of these designated for each year.) If you need to reference a specific bill just go to that month's folder and retrieve it. This system makes it really easy to file the paid bills at the end of your weekly paperwork session too. You can just drop basically everything into the file folder and move on to the next task. It is so simple and easy, so there is no reason to put it off until later. There is no need to have separate folders for each type of bill, typically. The reason is that although you will have enough room to save a year or two's worth of bill stubs and statements once you've decluttered a lot of the papers you were previously holding onto, it is not that likely you'll need to reference these old bills that frequently. Therefore, I would not spend a lot of time sorting the paid bills into multiple folders, or making the organizational system more complicated, because it would not be worth your time. Here's a photo from a reader, Vena, showing how easy this system is to set up. She stated, "Thank you, thank you, thank you for the push! I have had this folder for...likely more than a year. I now have it set up and ready to go. All I needed was to be told to go do it!" Generally you don't need to keep paid bills indefinitely, and you definitely don't need to spend a lot of time sorting out the paid water bill from the paid electric bill. However, if your bill statement is something you need to use for backup documentation for your tax documents, then we are dealing with a completely different scenario. In that situation those bills should be kept in a separate set of tax documents files that we'll discuss more in depth in next week's challenge, because you will need to be able to reference them more easily, and also you will need to retain the bill statements for much longer (as long as you need for tax documents, which is often approximately 7 years). 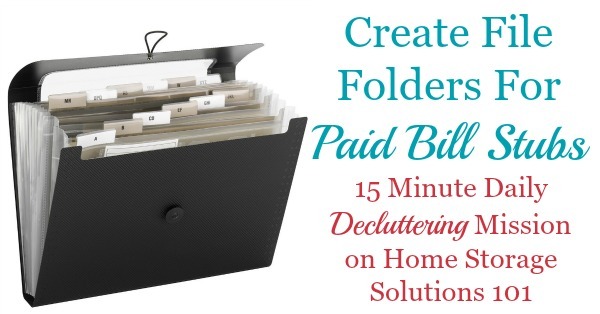 So get yourself an expandable file folder today, and do this quick mission to organize these paid bills, and you'll be one step closer to getting your home filing system, in general, in good shape.